SurveilStar Pro is the perfect parental control software choice for parents looking for software to monitor their child’s computer and online activity and for those that do not have regular access to the computer you need to monitor! Note : Not available for Mac. Monitor up to 5 computers in 30 days with full functions! This document provides detailed guidelines on how to deploy SurveilStar PC/Internet monitoring software. Content on this topic is also available in both PDF and Doc documents, you can download either of the document for latter reference. Check Overview of SurveilStar employee monitoring system before getting started. Please make sure to follow the steps below to deploy SurveilStar employee monitoring software. In choosing SQL Server application, you can select one of the free editions or pay to buy the enterprise edition. When selecting a version of SQL Server, you should review and follow the installation instructions suggested by Microsoft. Free edition MSDE 2000 SP4 Maximum storage capacity: 2 GB. Not compatible with Vista. Included in SurveilStar setup file. SQL Server 2005 Express SP1 Maximum storage capacity: 4 GB. SQL Server 2008 (R2) Express Maximum storage capacity: 10 GB. Enterprise edition SQL Server 2000 SP4 Please contact Microsoft to get enterprise edition. Note: Before installing SQL Server, you may need to update Windows Installer, .Net Framework and Windows PowerShell. If you have installed them or newer version, you can skip the steps below. Version after 3.11 supports MSDE as the built-in database engine. For data size less than 2G bytes, No other database systems such as SQL Server are required. We recommend use this engine when 5 or less computers are being monitored and snapshot capture is not enabled. If you use SQL Server 2005 SP1 or above, please make sure you follow the instructions in the manual since you need to manually set configurations in some important steps, otherwise, wrong configuration may lead to server launch failure. When using SQL Server 2005 SP1 or above as database server, please uncheck MSDE when you install the SurveilStar server. Before installing SurveilStar Server, please make sure the SQL Server application is running. 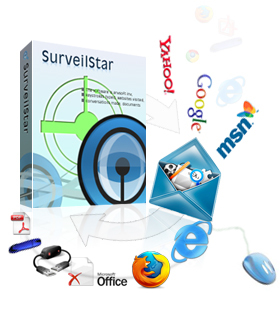 You can download SurveilStar setup file from our website. SurveilStar Server should be installed in the same computer with the SQL Server application. When prompted to select components, choose SurveilStar Server, and then proceed. 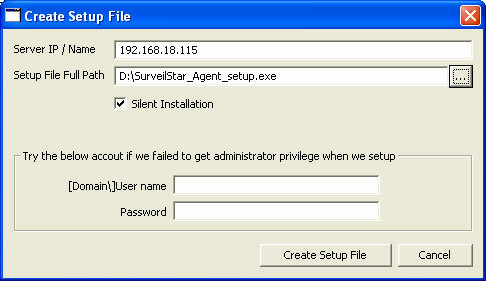 The installation of SurveilStar Console uses the same setup file as installing the SurveilStar Server. Select SurveilStar Console when prompted to select components, and then proceed. SurveilStar Agent should be deployed to computers that are required to be monitored and controlled. The Agent can install in silence mode and run in stealth mode. On the desktop of the server, click "Start > All Programs > SurveilStar > Agent Installation Generator"
Server IP/Name: Specify the IP address of the server here. If more than one server exists, please use comma to separate them. Static IP and Dynamic DNS are supported. Setup File Full Path: Choose a folder to save the setup file, and give it a file name. Silent Installation: If you check this option, the Agent will install without showing any visible interface. Account info: Installing SurveilStar Agent requires administrator privilege. Step 3. Double-click the setup file to install the Agent. After installing SurveilStar Server, Agent and Console successfully, you can now log on SurveilStar to view information from monitored computers. Find complete online how-to guides.